More than ever, organizations rely on the support of training to execute strategy and change. At the same time, most training as it is designed today is too “event” based and does not engage learners in a meaningful and effective performance improvement process. In this certification program designed and developed jointly with Robert Brinkerhoff, trainers, facilitators and instructional designers will get the tools to make training programs and create new and lasting behaviors for their participants. This innovative program builds on Prof. Brinkerhoff’s previous work – integrating performance improvement concepts, practical applications of the 70-20-10 concept, and fundamental learning theories into a unique learning experience for each participant. Key tasks and assignments are embedded into a seamless process that can transform and add value to more traditional group learning interventions, such as workshops and seminars. This High Performance Learning Journeys (HPLJ) approach has been proven to dramatically increase the impact of training on workplace performance. 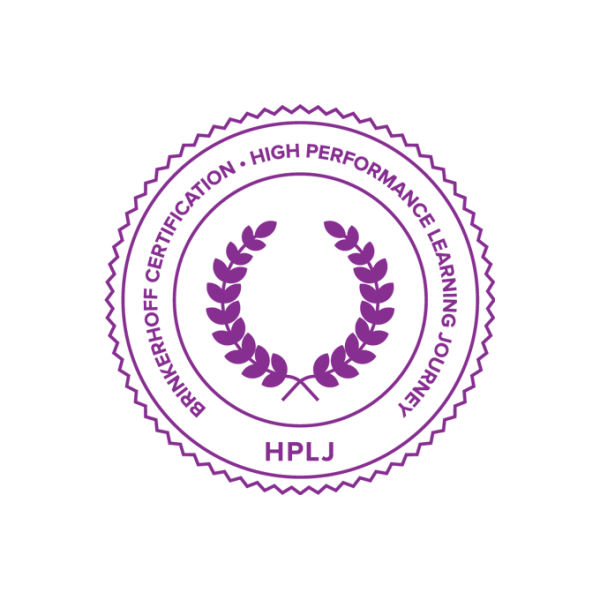 The HPLJ certification program is highly hands-on and practical, giving you first-hand experience of using powerful tools and proven techniques that you will put into practice in your own working environment during the certification process. Instructional designers and other learning professionals wanting to design learning that drives sustained behavioral change, improves workplace performance and creates lasting results. You will join a cohort that includes instructional designers, facilitators, learning and development professionals/project managers, performance consultants, and others who wish to transform training. This training program contains practical solutions to assess, improve and build training programs to create performance change. During the program you will work with practical tools and templates that you will apply to improve your existing training curriculums. The program creates a learning journey that consists of mandatory pre- and post-work, a two-day practice oriented group workshop, and an examination assignment, that successfully completed, will earn the certification. Participants can proceed at their own pace, but the process is designed to span about 4-8 weeks, and will demand approximately 16 hours of individual learning assignments before and after the workshop. “The High Performance Learning Journey certification program was a great experience for me. The journey started with us identifying key benefits to us, picking a program that we would use to design through the journey, reading articles, participating in webinars and so many other assignments that we already felt well prepared when the 2 days of class-room session happened.